Catherine L. Ross, Ph.D. is Harry West Professor and director of the Center for Quality Growth and Regional Development (CQGRD) at Georgia Tech. She is deputy director of Tech’s Tier 1 University Center for Transportation System Productivity and Management, a $14 million designation. Ross attended Kent State University for her undergraduate degree, completed the master of regional planning and doctoral degree at Cornell University, and conducted post-doctoral work at the University of California at Berkeley. She has held several positions at Georgia Tech including vice provost and co-director of the Transportation Research and Education Center. In July 2009, Ross was selected to advise the Obama Administration on the first-ever White House Office of Urban Affairs. 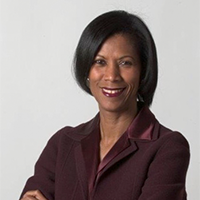 She served as the first executive director of the Georgia Regional Transportation Authority (GRTA) from 1999-2003, an innovative regional state agency created by the Georgia Legislature. GRTA was formed to help the region, out-of-compliance with clean air standards, develop new transportation services, plans, and strategies that met or exceeded federal requirements of the Clean Air Act Amendments (CAA) in order to restore the use of federal funds to the Atlanta region. An internationally known transportation and urban planner, Ross is one of the world’s expert on megaregions and sustainability. Her research interests and areas of expertise include transportation planning/impact analysis; regional planning and development; land-use planning; sustainable development and quality growth. She is a member of the National Academy of Public Administration (NAPA), and she serves on the board of directors of the AAA Auto Club Group. Ross is a former Urban Land Institute Fellow and past president of the National Association of Collegiate Schools of Planning (ACSP). She has served on numerous national academies committees including the Transportation Research Board Executive Committee, University Transportation Centers Program, and the board of directors of the ENO Transportation Foundation. Ross was selected for the Georgia Power Professor of Excellence in 2014. She is editor of Megaregions: Planning for Global Competitiveness (Island Press, 2009) and the co-author of The Inner City: Urban Poverty and Economic Development in the Next Century (1997). Her latest book, Health Impact Assessment in the United States, was released in spring 2014 by Springer. Ross conducts research on transportation and urban planning and how to make cities, neighborhoods, and regions safer, healthier places for all to live. She has authored numerous journal articles, books, and research reports and media publications including the Wall Street Journal, Urban Land Institute, Atlanta Journal-Constitution, USA Today, and others. Her current research examines freight impact and passenger mobility options for cities and regions including examination of the increasing role of e-commerce and emerging technologies. Her work includes a multidisciplinary focus on resiliency and sustainability and the inequities that may occur.